Dandelion is a 3D graph rendering application that can be controlled across the network. Its main purpose is to allow clear network graphs to be rendered in a window, which can be controlled by a separate application or the user. The Dandelion visualisation is actually controlled by issuing simple commands to it across the network (although this could all be happening on a single machine). The Dandelion source includes a set of very simple libraries that can be incorporated into other applications and which can be used to send these commands. Libraries are included for C, C#, Java and Python. The commands are very simple, so providing libraries for other languages would be very straightforward (get in touch if you'd like one to be created). Some of the features provided by Dandelion are the following. 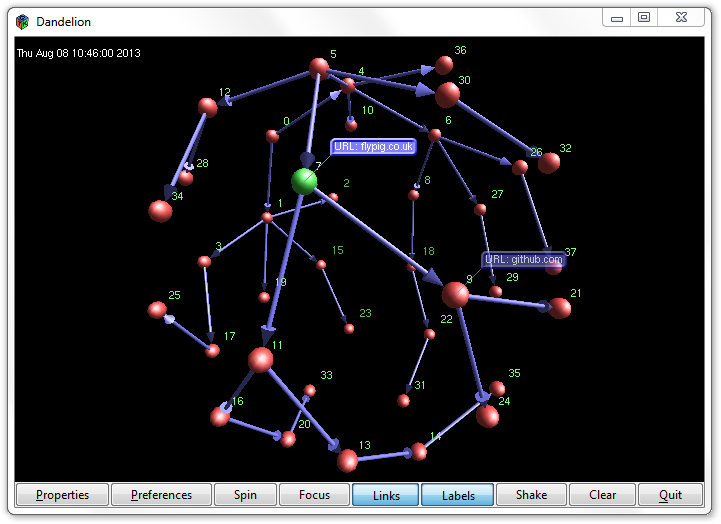 Generate 3D network graphs for clear visualisation. 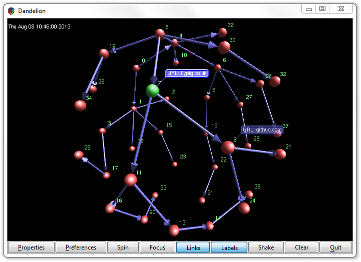 Automatic node layout using a modified force-directed Fruchterman-Reingold algorithm. Full control over graph structure and properties across a network. Graph links can be uni- or bi-directional. 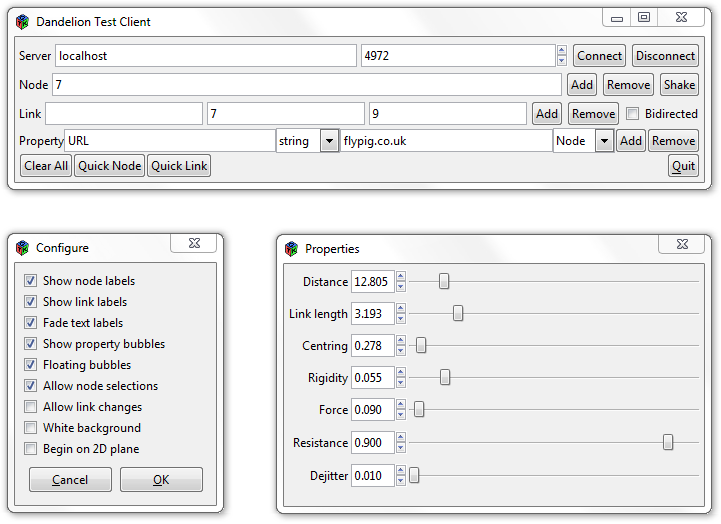 Full control over node and link colours. Names and arbitrary additional typed properties can be assigned to nodes and links. Properties are viewable as graph annotations. Links can be controlled programmatically or by the user. Scalable: machines with a fast graphics card can handle hundreds or thousands of nodes. Clients supplied in C, C#, Java and Python allow commands to be issued using a simple GUI. Libraries for C, C#, Java and Python supplied for integration with other applications. GTK 2+ interface allows the software to run on Windows, Linux, Maemo, etc. For bug reporting, documentation and other useful tools see the Dandelion project page and Documentation Wiki on GitHub. Dandelion is released under an LGPL v.3 License and the source can be obtained from GitHub. Click the icon for the Dandelion news RSS feed. The following video uses Dandelion to demonstrate a memory thread network. 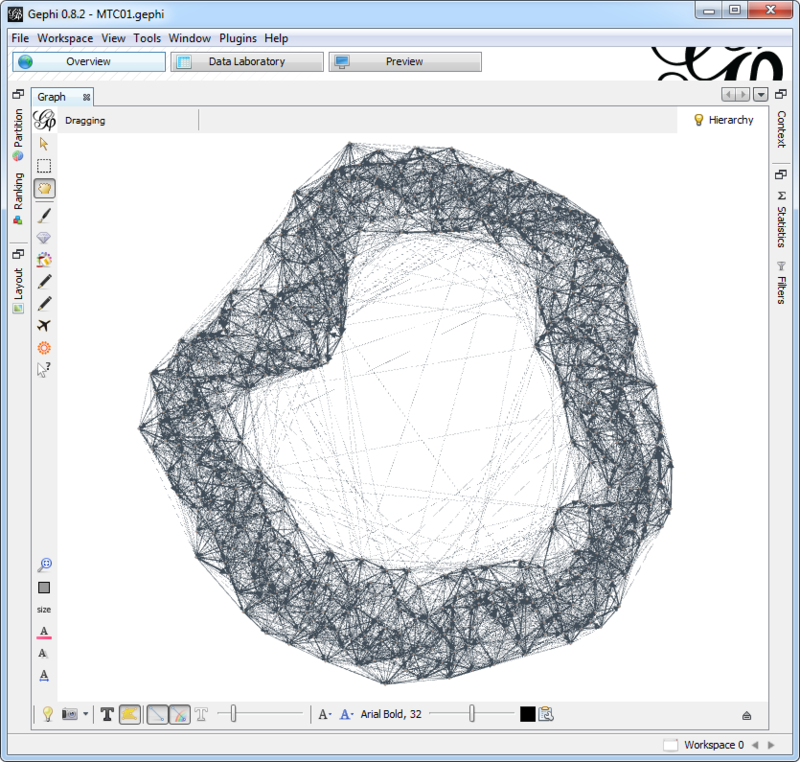 The data was imported via a GDF format file, giving a flavour of how Dandelion can be used to visualise larger networks. There's also a paper that describes the theory that underlies this video. Download the latest version of Dandelion in one of the following formats. Dandelion is now available in my Launchpad PPA, so anyone using Ubuntu can install it and get updates with much ease and simplicity. Added Memory Threads demo video to the Dandelion page. I'm pleased to announce the release of Dandelion version 1.0.0. 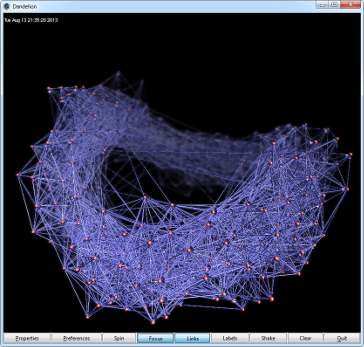 Dandelion is an Open Source (LGPL) 3D network graph visualisation tool that can be controlled by other programs through a simple network interface. The source code is up on GitHub and you can download Windows and Linux deb installers from the Dandelion page. As always this is just an initial release. Hopefully I'll get time to implement the many more improvements planned in the near future. Version 1 (8 Aug 2013) for Linux and Windows.